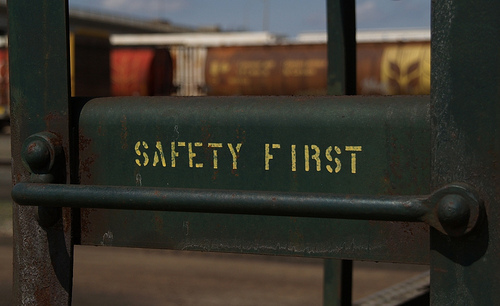 Ensure you wear safety glasses, goggles or a better still a full face shield at all times when the saw is running. Protect yourself from harmful dust by wearing a dust mask. Ensure that the height of the blade is only just higher than the piece of timber being cut. The blade should be no higher than 1/4 inch (6mm) higher than the timber. This means that of your hand slips you will only receive a cut rather than using a limb. Always disconnect the power at the socket before changing the blade or carrying out any other maintenance on your saw. Make sure that the blade has completely stopped turning before you make any adjustments to the table saw. Make sure that the surface of the table is as smooth and clear of debris as can be. rough surfaces need more pressure to move the timber over the surface which can mean a greater risk of slipping and causing injury. Ensure that the fence is perfectly parallel to the blade prevent binding the timber between the fence and the blade. Check that the throat plate fits exactly in cutout and has a slot just slightly larger that the blade. Never operate a table saw with the throat plate removed. 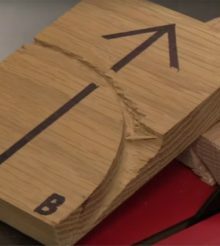 as offcuts of timber can fall into the inside of the table saw causing damage to you and/or the saw. make sure that the timber has no nails or screw etc. in it prior to cutting. These small bits of metal can become projectiles and cause injury. Do not use the fence and a miter gauge at the same time. 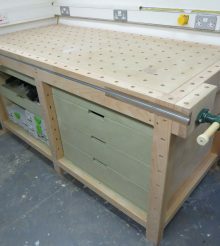 The table saw should be fitted with a blade guard that completely covers the blade that is projecting above the table. The guard should ride the thickness of the stock being cut, adjusting to the thickness of the stock. Make use of a push stick to cut timber that is 6 in (15cm) or less in width. Ensure you position yourself so that your body is NOT in line with the blade. This is to avoid being injured by flying sawdust, wood chips or kick backed timber. Stand firmly on the floor and avoid any awkward operations. This is to avoid falling into the blade by slipping or losing your balance. Do not carry on a conversation while using the saw. All your attention should be on the job at hand. Do not reach behind or over the blade until it has stopped turning. Do not leave the saw unattended until the blade has come to a complete stop. Do not make free-hand cuts on the table saw. 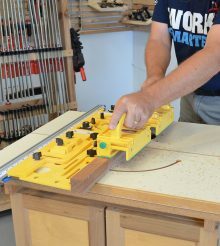 The stock must be guided through the blade either by the rip fence or the miter gauge. Work should be released and lifted away only when it has gone past the blade. Ensure that the stock does not lift when passed over the blade, the saw can shake the stock, causing you to lose your grip. Losing your grip on a piece means that your hand can slip toward the saw blade or the work can be kicked back towards you. Never adjust the fence while the saw is running.